Next step: Figuring out where to put all the toys! For some this may be a dreaded task but for me this is the most exciting part…organizational heaven! Before I share the a-type bliss, keep in mind that the photos I’m using in these posts were after a playroom clean up. I’m all about keeping it real and real life with kids does NOT look like this! Typically half the toys are on the floor, buckets are emptied, bins are pulled out and despite my organization fetish, I believe that is the sign of a truly fun play space! It brings me much joy to see the creative ways the kids enjoy their space. We allow the kids to go to town when it’s time to play but in a future post, I will share how we maintain the play space and manage toy overload. 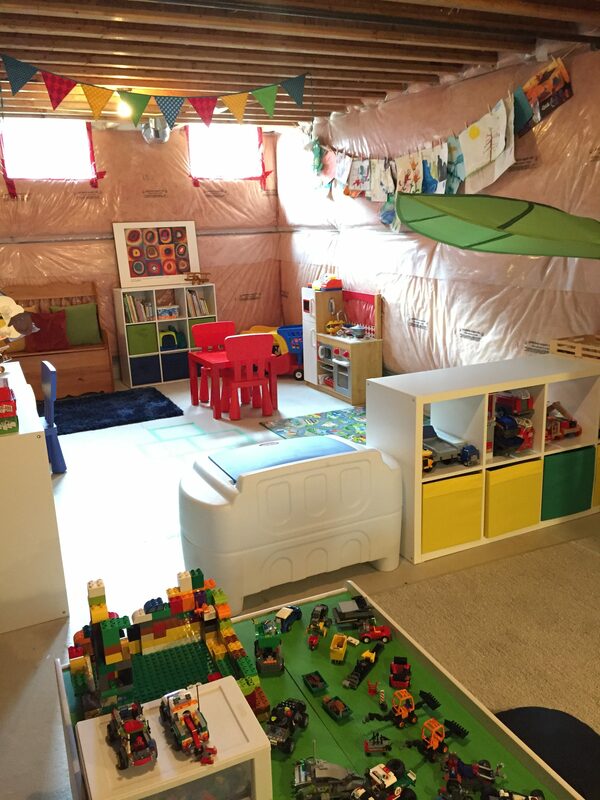 One way to help encourage play and break up a large room is to create mini play stations and group toys by how the kids play. This was my favorite part of building the playroom. I had to think like a little person and keep in mind the ways my kids express their creativity. 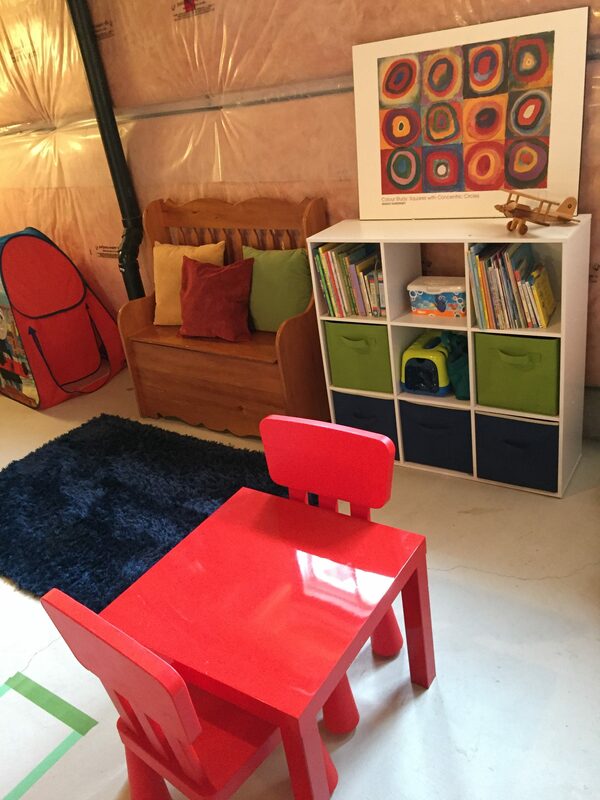 We used furniture to divide the room into a little kids play area and a space designed for big kids only. On both sides, we used mats and various kid friendly floor covers to divide the spaces into smaller play areas. Imagination station: This is the corner where bake shops are born and cupcakes and cookies are served any time of the day! We dress up in our finest attire and have tea like a princess…or ninja. Elaborate store fronts are merchandised with wooden play food and the shopping cart is filled until checkout time at the cash register. The stuffed animals are well cared for by veterinarians and dolls get regular checkups. 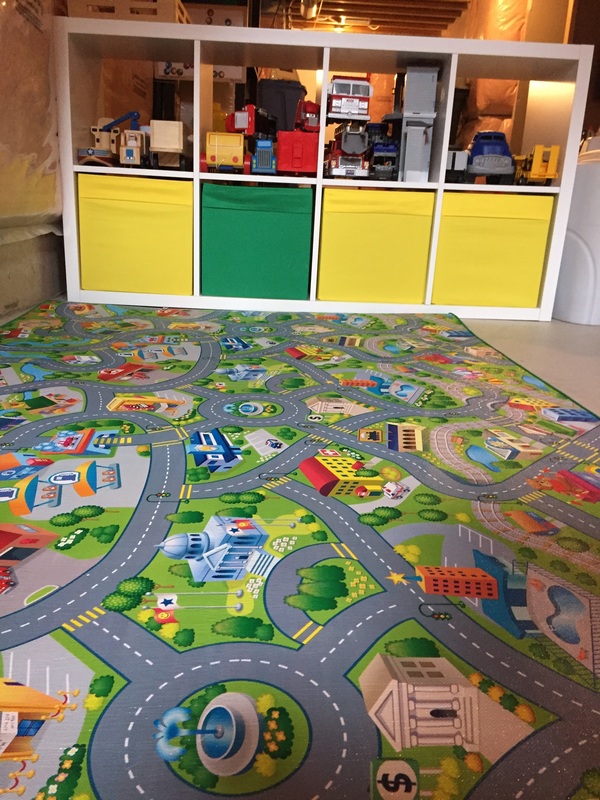 Motor world: Our mat with roads and towns was positioned next to one of the shelves th at we stocked with all of the car and truck toys. The bins are filled with the dinkies and wooden cars and trucks, The open shelves house Playmobil fire tucks and police jeeps. Hot wheels racetracks are stored in a plastic bin on wheels nearby. The toy box next to the shelf contains the wooden tracks, mountains, tunnels, cranes and houses. The bins below are filled with the trains and accessories. Reading corner: I love practical furniture and one of my most coveted pieces is an old deacons bench that my dad made. It’s a little warped and has a crack in it, but it still gets lots of love in our playroom. The seat of the bench is lined with colorful velour pillows and inside you will find cozy kids blankets. Both are used for fort building, but most often are laid out on the shag rug in front of the bench for some cozy reading. The books are stacked on a shelf nearby. Game table: The kids table is situated next to the open shelves that house chunky wood puzzles and games for the little’s. This is where you will find toys like a barrel of monkeys and Mr. Potato head hanging out. Other toys are grouped together by category on shelves too. For example, we have a few bins filled with little people accessories and the shelves above house the little people chunky barns, zoos and trains. 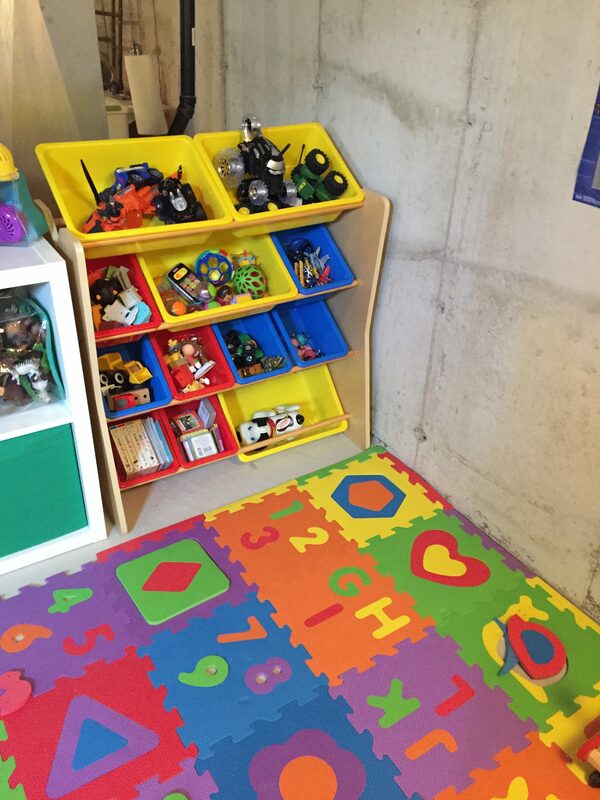 No matter how well you organize a space, you will always need something to store the mishmash of toys that don’t really fit into any category. 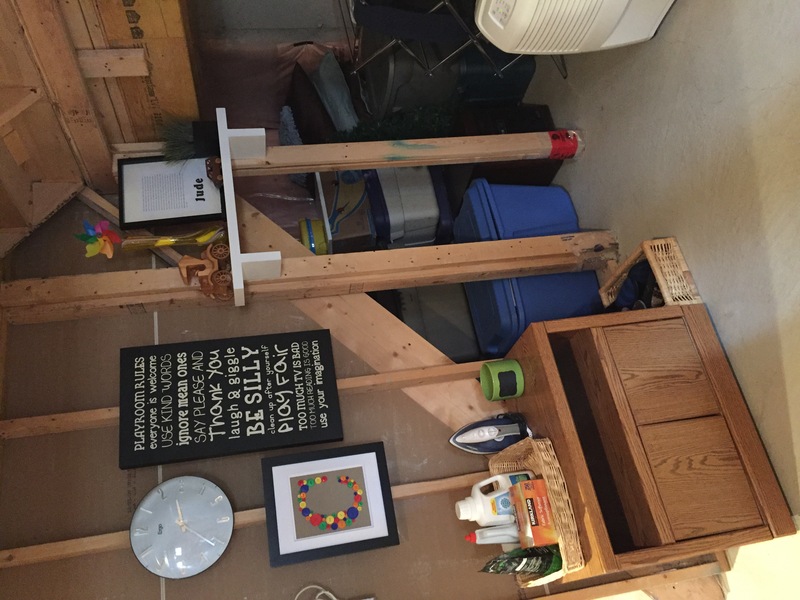 We use an open bin storage shelf for the miscellaneous baby and toddler toys. We kept the middle floor space open for hopscotch, pull and push toys and ride-on’s. We wanted the kids to have space to run and jump to release some energy and exercise their gross motor skills. We used a tall bookshelf on the big kids side and even though the space is unfinished, we found a clever way to secure it to the wall. Check out my previous post. As much as I tried to keep things accessible for the kids, there are certain things I expect them to ask permission to use. Play doh, boredom boxes and games with small pieces all fit into that category and are kept on the top shelves out of reach. Craft corner: Since it’s difficult to hang things from an unfinished wall, I took full advantage of the sides of the tall shelf. Using industrial zip ties, I hung a 3 sprouts canvas storage bag. I am a HUGE fan of t he entire 3 sprouts storage line. 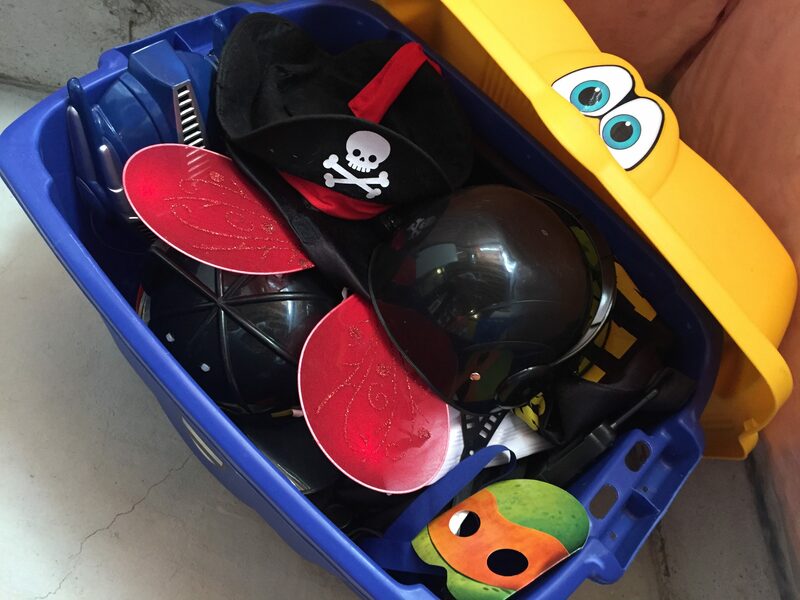 I wrote about my love for their storage bins here: Fab Find Friday – 3 Sprouts Storage Bin This particular storage bag is where we keep construction paper, coloring books and stickers. Below sits a 3 drawer Rubbermaid container. I used chalkboard labels to identify the crafty contents in each drawer. It is here that we keep crayons, markers and paints as well as other fun supplies for crafts, including pipe cleaners, pom poms, and beads. The easel is positioned next to a table where we sit for playing games, doing puzzles and crafting. There is appeal in an unfinished space when it comes to getting messy with crafts and paints. No big deal if some paint hits the floor. It’s also nice to lay out big sheets of paper on the cement floor to make murals. One of the features I enjoy most of the unfinished space that lends well to crafting messes, is the big laundry sink. It is PERFECT for cleaning up messy paint and brushes. I installed a paper towel holder close by and we situated a step stool so the kids can wash their hands. The furniture on the little kids side is low to discourage climbing and all toys are self-serve and accessible by little people. As much as I like to hide some of the mishmash with enclosed bins, we ensured the bins are easy to get into and balance bins with an equal amount of open shelves to house the bigger chunky toys. Using clear containers makes favorite toys easy to find and leaving some surfaces clear allows kids to stand and play. This is your kids space so make it fun! 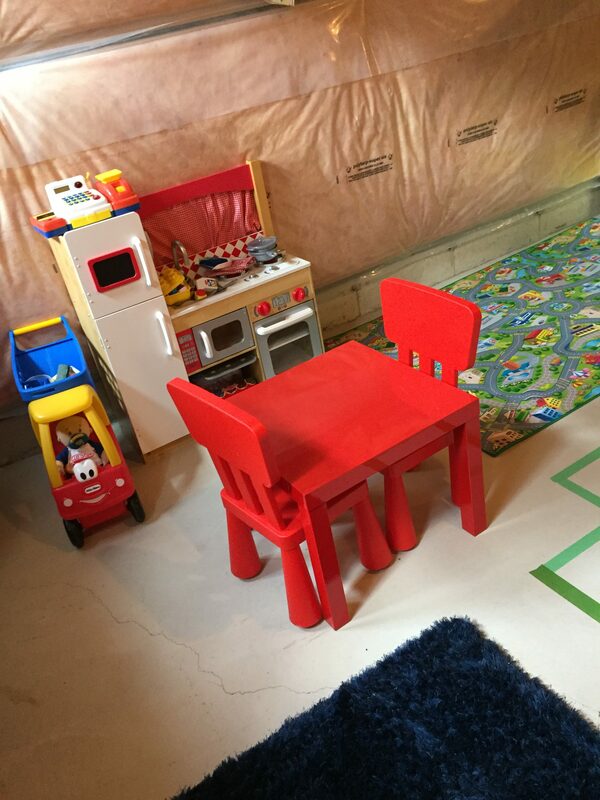 We chose primary colors to brighten up the otherwise drab feeling of an unfinished basement. 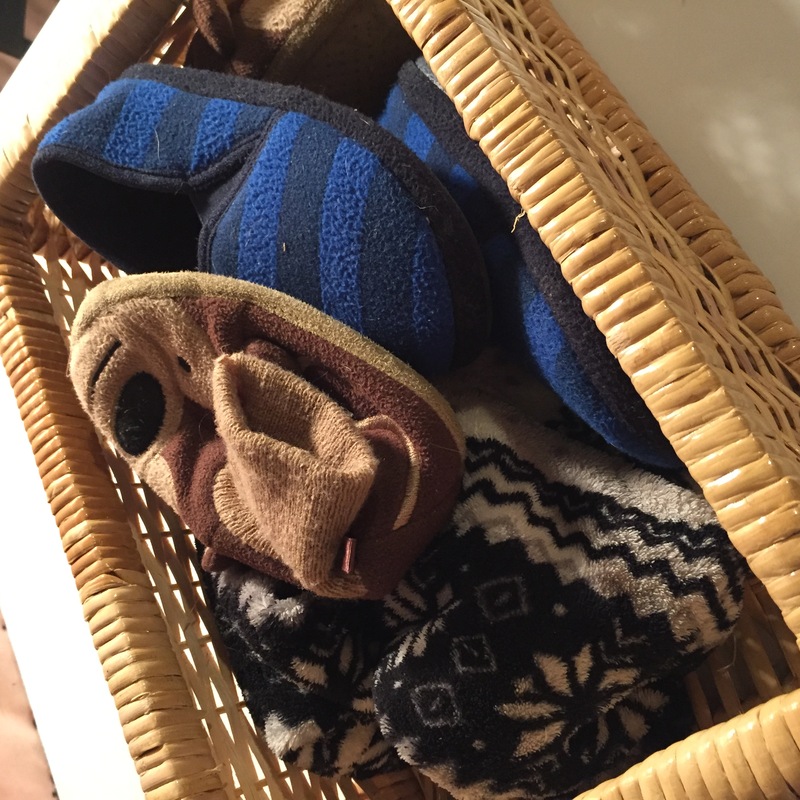 We keep a basket of slippers to keep our feet warm on the basement floors. I had to get creative with wall hangings and shelving since we don’t have finished walls, but I was able to hang some personalized wall art and rig up a shelf for special personalized decor.